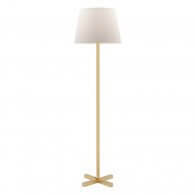 An eye-catching design, this floor lamp fuses luxurious elements for a look that elevates any space. In black, with brass-coloured metal accents, it even includes a marble-effect stone table in the centre, so it can be used as a drink holder, too. Style it in your living room for a beautiful refresher.